Summer is here, which means peak wedding season is upon us. While summer is not the only time of the year to get married, it seems like a loftier amount of people decide to tie the knot once the weather heats up. This can only mean one thing: you need to find something to wear. Whether it’s to impress an old flame, charm a new one, or simply not look terrible in all those Instagram photos that are surely to be a haunting reminder for years to come, we all want to look better than the average wedding guest. 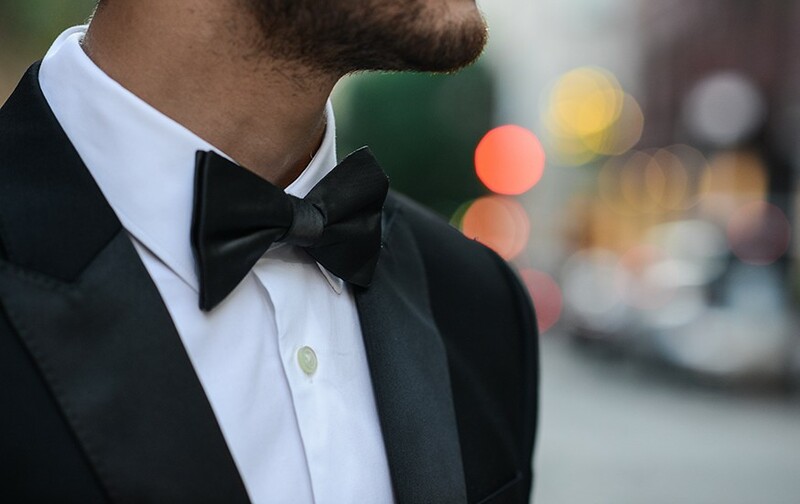 Deciding what to wear to a wedding can be reasonably straightforward if the dress code is strictly black tie, but potentially baffling if there are no sartorial rules. 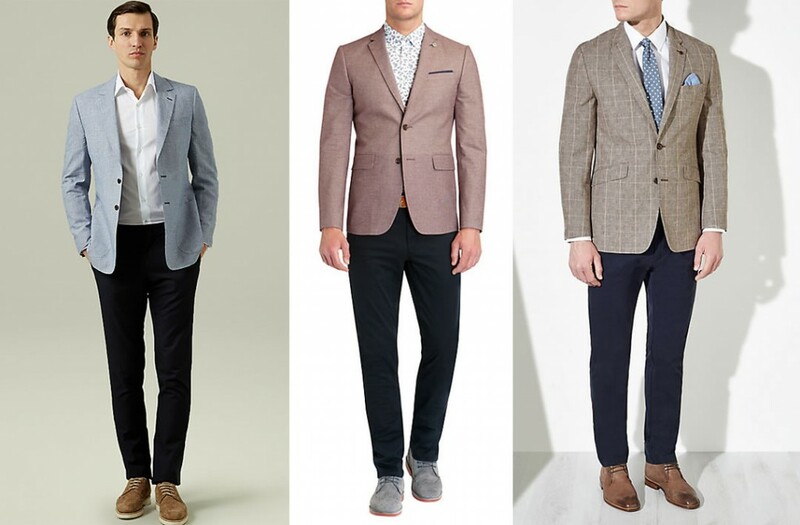 Not to worry, we’ve compiled a go-to men’s style guide bursting with tips and outfit ideas that are sure to help you figure out what to wear to any wedding regardless of the season. I cannot stress this enough – READ the wedding invitations thoroughly. Those off-white pieces of parchment that smell like lavender are key to figuring out what is appropriate for the occasion. Make sure to pour over the details to see if the happy couple has specified a dress code (most may not). However, you always want to be on the safe side to avoid showing up in a flamboyant sports coat when the event is black tie. No matter where you live, every woman has heard the phrase, “don’t outshine the bride”. Well gentlemen, the same applies for the groom. Let’s face it, a wedding is all about the two people at the end of the aisle; everyone else is just there to join in on the celebration. Of course, we understand that some people simply dress extremely well and it is sure to win you major style points, but do you really have to wear an over the top suit? Maybe it would best be worn for another occasion. Let your newly committed buddy steal the spotlight for once! Probably the most important detail to know before deciding what to wear to a wedding is figuring out where it is going to take place. For instance, if it’s going to be a beach destination wedding along the French Riviera, then dressing in light layers such as a linen suit, a white short-sleeved shirt & some loafers or boat shoes is ideal. However, if the wedding is going to be in mid-November or simply in a brisker climate, it would be wise to wear a two or three-piece suit, an Oxford shirt, slim fit tie, and some loafers. Presuming you’re not a part of the wedding party, black tie means a tuxedo. The chances of you attending a wedding that requires you to shimmy on a tuxedo are slim, but that doesn’t mean it can’t happen. It’s best to be prepared. Whether you decide to rent a tuxedo or buy your own, you have to decide, “How often will I actually wear this?” If the answer is not enough, then it’s probably best to just rent it. However, a tuxedo is a great buy and can last a lifetime as long as your body shape doesn’t change considerably. When deciding which tux to get, always go black or midnight blue. These two colors are classic and ageless regardless of the era. As for accessories, there are a few must-have essentials such as a black bow tie, a white pocket square, and last but not least, a pair of nicely polished dress shoes. If you want to add a bit of personality to your outfit, you can exchange those shiny dress shoes for a pair of velvet slippers. Depending on your style sensibilities and comfort, cufflinks and suspenders are optional. Most weddings will be black tie optional, so sporting a two or three-piece suit will suffice. The two or three-piece suit is the ultimate all-rounder that satisfies most wedding dress codes. As mentioned earlier depending on the location, lightweight materials such as linens are the right choice for weddings in hotter climates, while wool and a cotton-wool blend are a superior choice in cooler conditions. 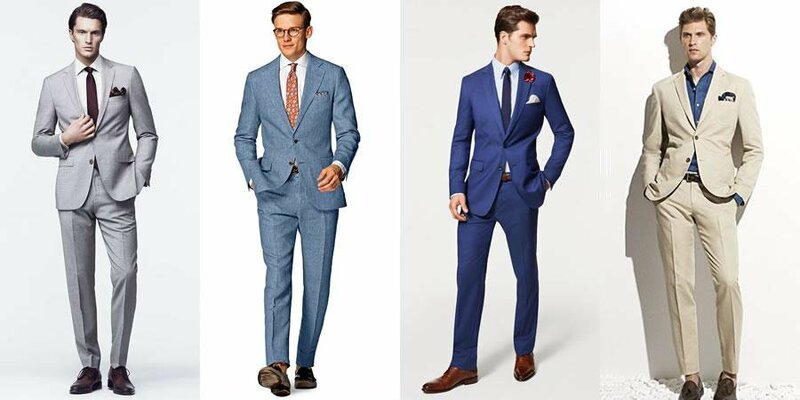 Of course, a major decision when finding the right suit is deciding on a shade. For a versatile suit that won’t go out of fashion (at least anytime soon) opt for navy, charcoal grey or try a lighter hue such as dainty grey. However, for the summer time, you might consider going with a warm neutral such as beige or stone. Regardless of the color you decide to sport, there are a few key pieces that are a must. For your base layer, you need to put on a freshly ironed white or light blue shirt preferably long sleeve. Pair it with a lightweight tie that complements the color of the suit and your favorite footwear (a pair of loafers, wing-tip dress shoes, or some cap toe Oxford’s are highly recommended). For an added hint of elegance, make sure to add a solid and/or printed pocket square and some eye-popping cuff links. It’s safe to say that more people are opting to have less formal weddings, which gives wedding guests more sartorial freedom to modify their suiting with some tailored separates (of course this is optional). Play with different shades and patterns, but make sure they are harmonizing. For example, some shades that pair well with each other are: shades of blue and grey, white and baby blue, or go from dark to light. So, what’s your ultimate wedding look? How do you adhere to a dress code without looking dull? Comment below to share your tips and thoughts.